Growing lantana flowers in the garden attracts butterflies and adds a pop of bright tropical color. Lantana are considered annuals through most of the United States but in some warmer climates in the southeast they may be classified as perennials. Lantana offers, not just beautiful flowers, but support for wildlife too. Lantana flowers go by many names. In the southern part of the United States, you may hear them referred to as "bacon and eggs" or "ham and eggs" for instance. One of the interesting characteristics of lantana flowers is the nearly fluorescent quality of the flowers. Many varieties contain different colored petals growing right next to each other, forming clusters that combine yellow, orange, pink and blue naturally. Others have solid colored flowers. The flowers are lightly scented and grow profusely once the plant reaches maturity. They'll continue to bloom in the garden throughout the summer and until the first frost. Lantana may be potted up and brought inside to winter as a houseplant, or simply replant new lantana outside, if you lose yours to frost and cold. Lantana prefers rich, well drained soil although it will tolerate many different soil conditions. If your soil contains a high amount of clay or sand, add compost to improve the soil's fertility. Always use well-aged compost or manure since fresh can burn tender plants.Plant lantana flowers in full sun or partial sun, making sure the plant receives at least six hours or more of direct, bright sunshine each day. It can tolerate a little shade in the afternoon but may not flower profusely in true partial shade. Water lantana thoroughly and do not let plants dry out. If your soil is sandy, be sure to water lantana daily. A good top dressing around the plants with mulch retains water and suppresses weeds. Lantana that doesn't receive enough water stops blooming or cuts back on its blooms. Plants that aren't blooming usually signal the need for deeper and more frequently watering. Lantana doesn't require fertilizer, if you're growing it for just one season and you've amended the garden soil with a good quality compost. You can add a balanced, gentle 20-20-20 fertilizer monthly, if desired. Don't go overboard with the fertilizer; lantana is truly carefree, and too much fertilizer can also cut back on the plant's blossoms. Generally lantana is a hardy, easy care plant. The plant produces toxins in the leaves which make it unpalatable to deer, rabbits and mice, although they may nibble out of curiosity. Common insect pests that attack lantana are the lantana lace bug and mites. Lantana lace bugs are about a quarter to an eight of an inch long, gray, and have dark gray or black antennae. These bugs destroy blossoms and can also seriously damage foliage. Telltale signs include sightings of the bugs on the plants and foliage with bleach-like spots, as if you put blue jeans in the wash and they got bleach on them, large patches of white or light color on the dark leaves. To remove an infestation, use either insecticidal soap or horticultural oil, or a general insect spray. Read the label for directions on proper use, storage and disposal and to ensure the spray is compatible with lantana flowers. Lantana flowers make excellent container plants and garden bedding plants. They're traditionally planted in butterfly gardens. Lantana flowers attract swallowtail butterflies and many other species as well as hummingbirds. Plant lantana flowers in tubs, containers and window boxes, massing them with other tropical plants and flowers. Be sure to water containers daily. With dozens and dozens of species to choose from, lantana flowers add a bright spot of color to the garden. 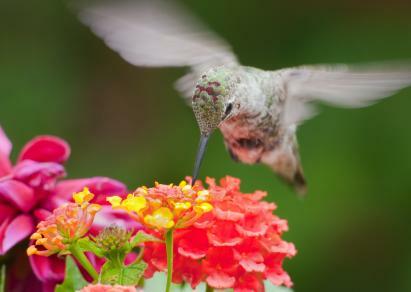 They attract hummingbirds and butterflies and are very easy to grow. Visit your local garden center for the lantana flowers that grow well in your gardening zone.